. . .I've been there three or four times—and he'll buy about five dollars' worth if I know him. First time I went there I sold him 'Treasure Island,' and he's talking about it yet. I sold him 'Robinson Crusoe,' and 'Little Women' for his daughter, and 'Huck Finn,' and Grubb's book about 'The Potato.' Last time I was there he wanted some Shakespeare, but I wouldn't give it to him. I didn't think he was up to it yet." Not as smooth or clever as Morley's later writing, but very sweet and fun! 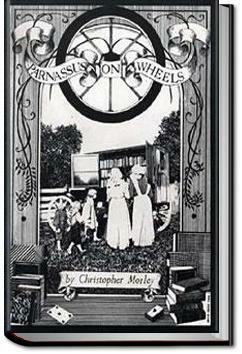 Come on, what book lover could hate a short novel about driving around in a horse-drawn wagon bringing books to the bookless? "What absurd victims of contrary desires we are! If a man is settled in one place he yearns to wander; when he wanders he yearns to have a home. And yet how bestial is content—all the great things in life are done by discontented people." " ... when you sell a man a book you don't just sell him twelve ounces of paper and ink and glue – you sell him a whole new life. Love and friendship and humour and ships at sea by night – there's all heaven and earth in a book." Without Goodreads friends I would never have been introduced to this utterly charming novella, written in 1917. ".…A good book ought to have something simple about it. And, like Eve, it ought to come from somewhere near the third rib; there ought to be a heart beating in it."